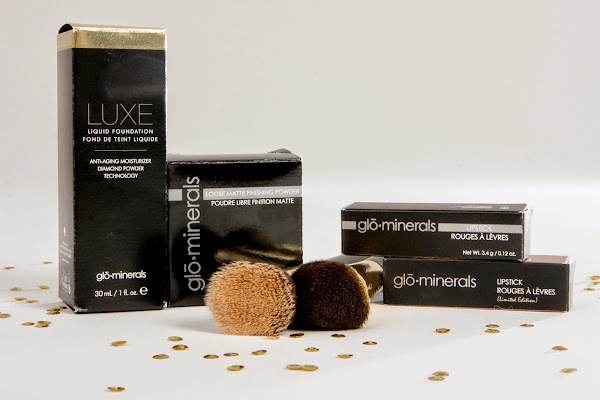 Jasmin daily : GLO MINERALS + GIVEAWAY! 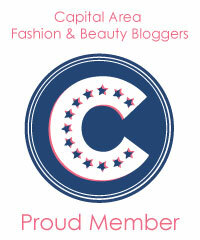 With a new year of blogging comes new ventures, and for me incorporating beauty into the blog is one of them. Let me start off by saying I am no beauty guru, I wear very little product on a daily basis and I turn to youtube videos when I do feel that an event warrants mascara or blush. When Glo Minerals first reached out to me, I giggled, I mean me, make up, HA! However I was on the hunt for a new foundation so I thought I'd call it fate. 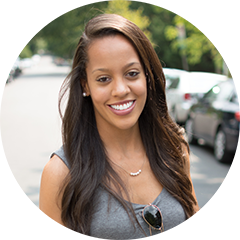 Well it was, immediately I was impressed by their customer service, for someone who knows very little they made me feel like an expert and helped me pick out some great products. It was suggested that I try the Luxe Liquid Foundation SPF 15 in Brulee, to which I was hesitant, see my t zone gets out of control oily and I feel like liquid foundation does nothing but emphasize it. Of course the experts know best and sent me over the Loose Matte Finishing Powder as well, which I love but actually don't even really need because, they were right, the liquid foundation is like no other! 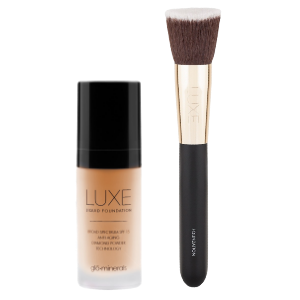 The Luxe Liquid Foundation applies flawlessly and is very build-able with the Luxe Foundation Brush, a flat top kabuki. I start off with two little drops on the brush and blend it all over my face, then I add one more drop to dab onto problem areas. 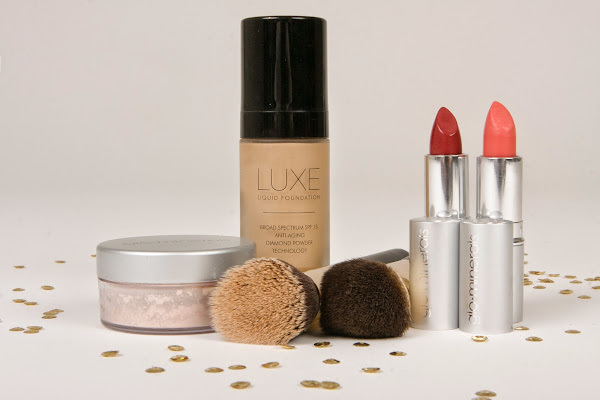 I tested the liquid foundation with the highly sought after Beauty Blender, that I have happily used with other products, BUT did not like with this foundation in particular, the Luxe Liquid Foundation & Luxe Foundation Brush are truly a match made in heaven! I swear this bottle will last me forever, a little bit of product goes a long way and the result is a smooth, very light, full coverage finish. The best part about it is the SPF 15, being able to confidently go out knowing that your skin is protected and still flawless is a win in my book. The Loose Matte Finishing Powder is definitely a life saver on those oily days, I apply a light dusting with the Luxe Setting Powder Brush, down my nose, at the top of my brow, and on my chin to prevent any extra moisture. It soaks up the oil and leaves you with a matte (not dry) finish. For those of you who follow along you know how much I love a good lip color (it's where I actually venture in the beauty realm) I got to try both 'Cabaret' and 'Spark' and love them both. Spark is great for everyday wear, while Cabaret is beautiful and elegant for a night out on the town or for a pop of color in my usually all black outfits. Most importantly, the colors last through meals and martinis and are very moisturizing. This is the first makeup line that I have been able to go all day wearing without having to reapply or touch up. 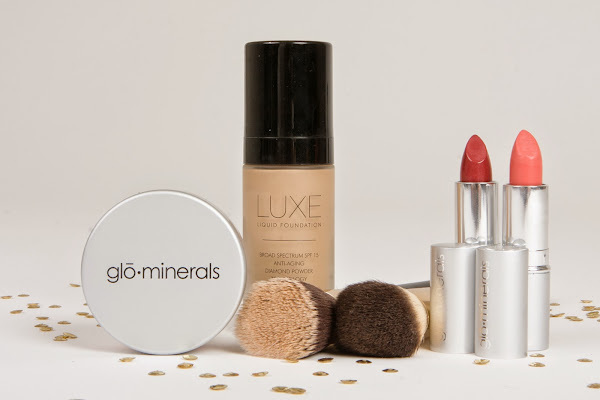 With other products I have had to mist or blot at some point to refresh the look and/or get rid of any extra moisture, I have not had that problem with my Glo Minerals products. Now for the really good stuff! 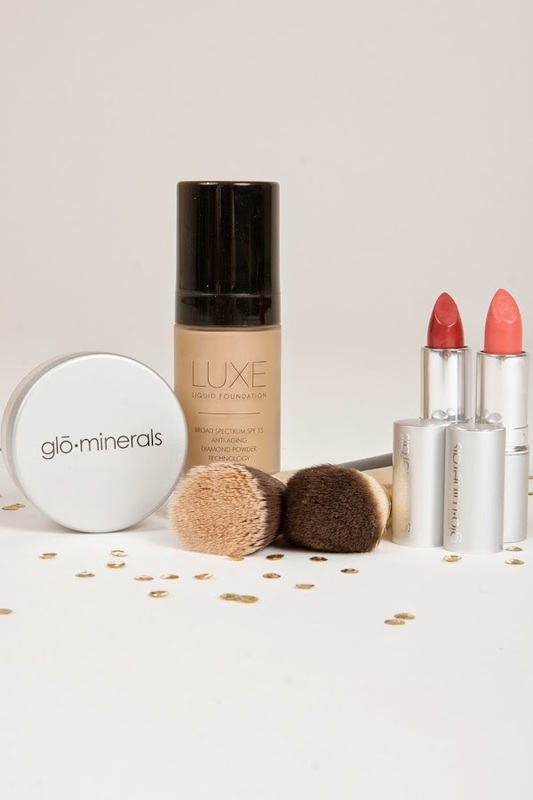 Get to it and try out Glo Minerals for yourself, use my code JASMIN10 at checkout and you will receive 10% off your entire order and free shipping! Also be sure to enter below for your chance to win the Luxe Liquid Foundation of your choice and it's perfect pair, the Luxe Foundation Brush! The giveaway ends at midnight on Sunday, February 1st, so spread the word and enter away!